Map of the rail trail from Clare to Evart. The 2-mile gap exists between Clare and the Moose Lodge staging area to the west. Take a bike ride with me. In a little under an hour we will cover four miles and 140 years (almost 160 years if we count the cannon) and see a mysterious and relatively rare structure, a dock, but not one that extends into the water, but one that rises high into the air. In two hours if we push it, we can be back at our cars. However, this is meant to be a leisurely roundtrip ride through forests, meadows, wetlands, farmland and along streams and a couple of lakes with towns on both ends where one can purchase beverages, meals, bike supplies and more (see end of article). 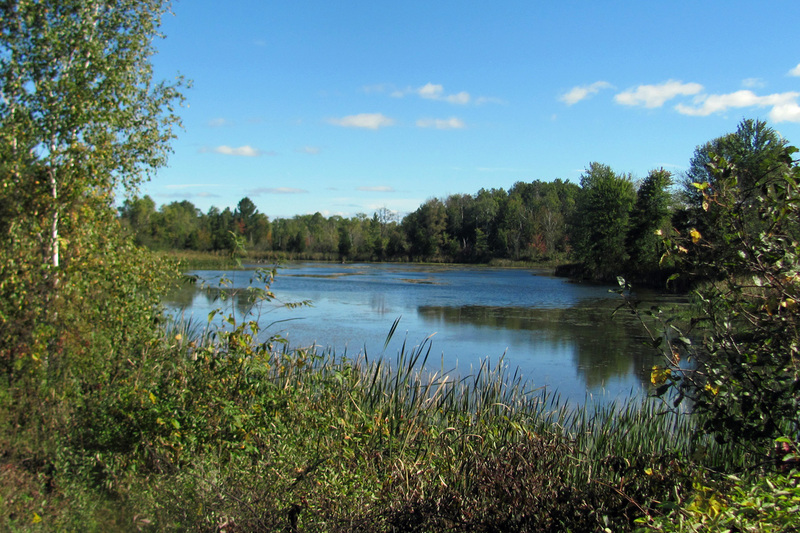 Also, along the way we might see deer, beaver, butterflies, a variety of waterfowl and more. 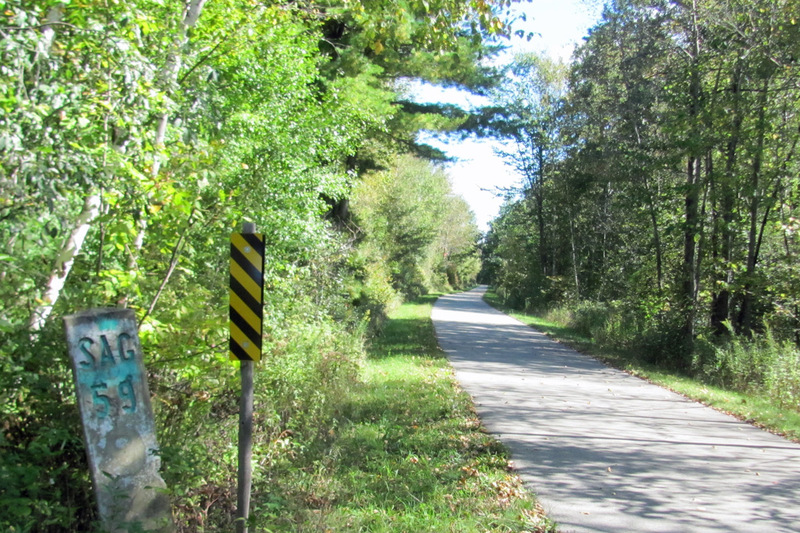 Ride in the fall and we will see trees alive with color and the trail too as the leaves settle on the asphalt surface. When we are done we will have used a few muscles and built more than a few memories. The trip can start in either of the two Clare County towns, or if we are really ambitious, can start as far to the east as Midland or as far to the west as Reed City or at any of the towns or staging areas in between. 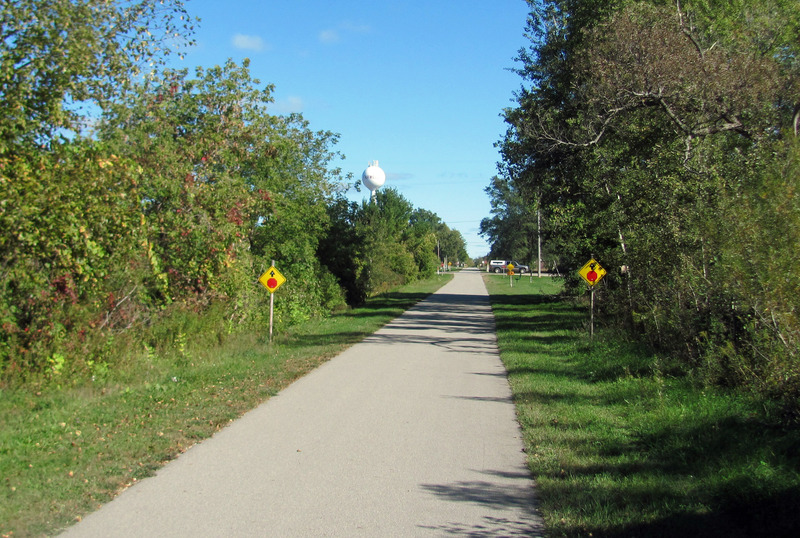 The route we will ride is part of the Pere Marquette Rail Trail, a now paved and relatively level trail that once was covered with heavy timbers and lengths of steel,which shook with the weight and power of steam and diesel locomotives hauling rail cars across the state. 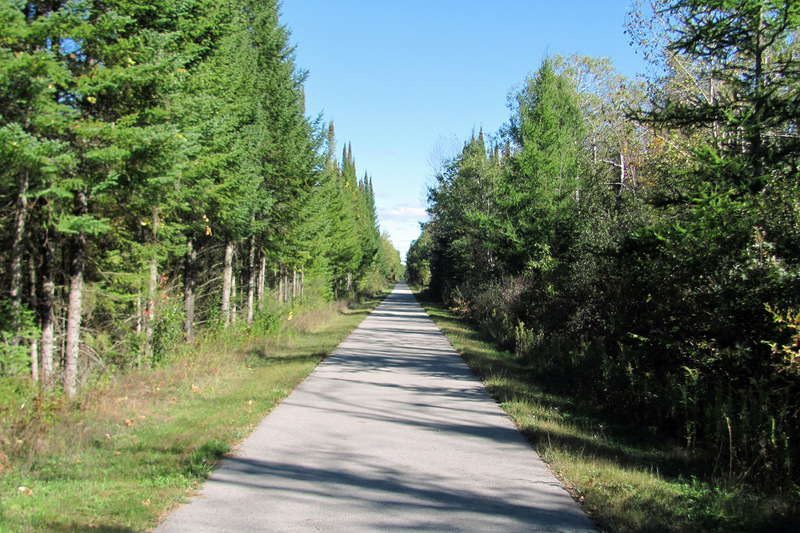 The grade was built in the 1870s and the coming of the railroad opened mid-Michigan to lumberjacks and lumber barons, farmers, schoolteachers, shopkeepers and families seeking to carve out a new life in what was then wilderness. They trains ran regularly and frequently until cars and trucks made this section of track uneconomical. Then the rails were pulled up and the grade abandoned until the ground beneath the tracks was reborn as a rail trail, thanks to volunteers and public private partnerships. Our trip though starts in Farwell, a former logging town founded in 1871. One can park at the rail trail staging area behind Isabella Bank or at Littlefield Park, both are just a block apart on the town’s main street and next to the rail trail. 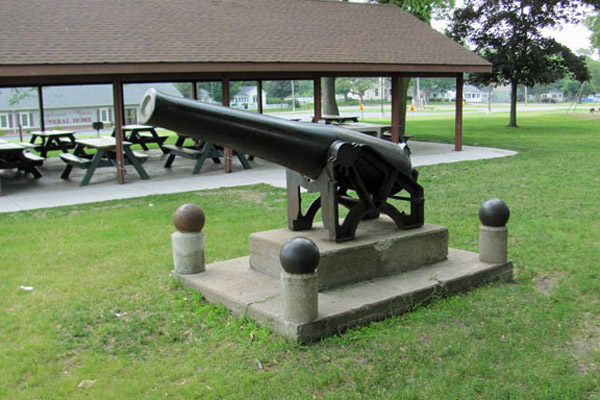 Littlefield Park has public rest rooms and a Civil War cannon that was obtained by veterans of that war in the 1890s. According to information available at the Farwell Historical Museum, the cannon was once fired in celebration but, unfortunately the resulting boom broke windows throughout the town so city fathers had the cannon plugged to eliminate the prospect of that ever happening again. The museum is housed in the Chamber of Commerce office on Main Street, and we can stop in to learn more about the town’s fascinating history during its open hours. From Farwell, head west. Within a few hundred yards we are out of the town and into the country with trees lining the trail. As you ride, imagine life back 140 years ago, when trains were the only way through this land and passengers rode through a tunnel of huge pine trees—some of them 100 feet tall. The only view of the sky they might have is when the train arrives in a town or when the train rolls past one of the lakes that dot the landscape. Take time to stop and enjoy the sights. 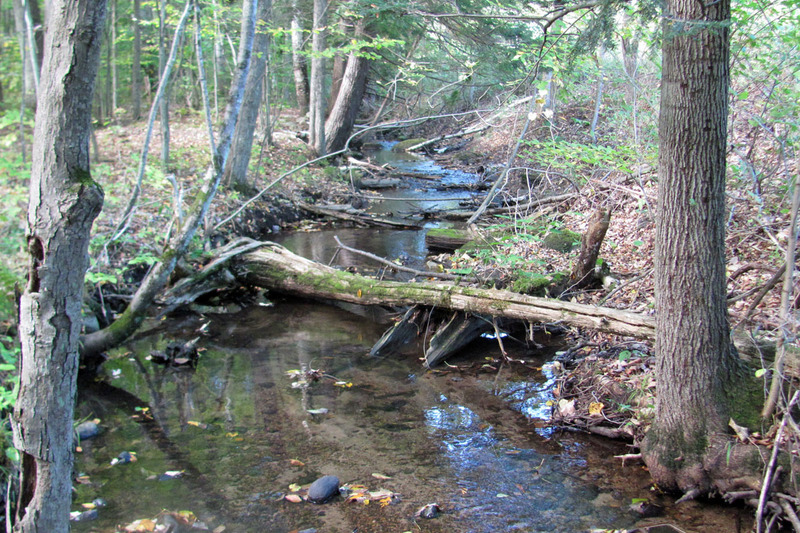 There is a small lake not far from Farwell and at several points along the way, small streams parallels the tracks. In one of them, you can still see some of the old railroad timbers that workers used to discard back in the days when environmental laws were still lax and that type of thing could be done. In another lake not too far from Lake, see if you can spot the beaver dam and maybe even a beaver. (I’ve never seen the latter.) There are benches along the way where we can stop to catch our breath or take in the scenery. Along the route we will also see a few scattered concrete signposts. These are leftovers from the railroad days to let the train crew know how many miles they were from Saginaw. 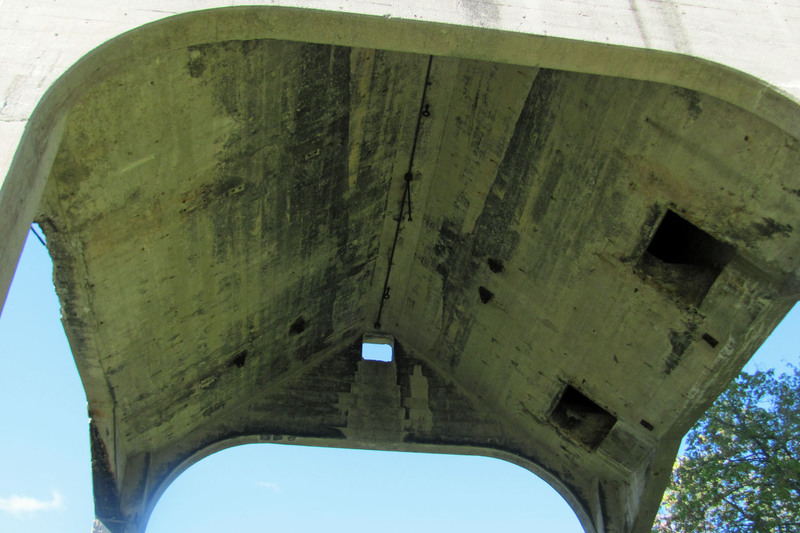 We will know when we are getting close to Lake when a large concrete structure looms into view. If we are in a group that has not seen it before, ask them to guess what it is. If anyone ventures that it’s a coal dock, he or she is correct. Coal docks (also called coal tipples or towers) were used to refill the coal cars of steam locomotives. This particular dock dates from 1929 and held up to five railroad cars of coal, according to one 1929 article in the Clare Sencould hold up to five rail cars of coal. While the rail trail now goes to the side of the dock, the track used to run through the dock so coal cars could be refilled when needed. The dock was used until steam locomotives were supplanted by the more powerful and efficient diesel locomotives in the 1950s. The Lake Station dock is now one of 17 in the state that have not been torn down, although this one is missing its electric elevator, the mechanism that lifted coal out of a now covered underground storage bin up into the dock. It’s also missing the doors and chutes that allowed the coal to flow into the waiting coal car. Even now you can find pieces of coal around the dock and can see where the storage bin once was. Please be careful as the area is not maintained and can be dangerous. Get on your bike and ride a few hundred yards further and we are in the town of Lake (also known as Lake Station. Once, Lake was a major tourist destination and ,excursion trains would come on summer weekends from Midland and other points bringing tourists to enjoy the cool clean waters of Perch, Crooked Lake and Eight Point Lakes. Now residents and visitors still come but now it’s by car, bicycle and snowmobile. 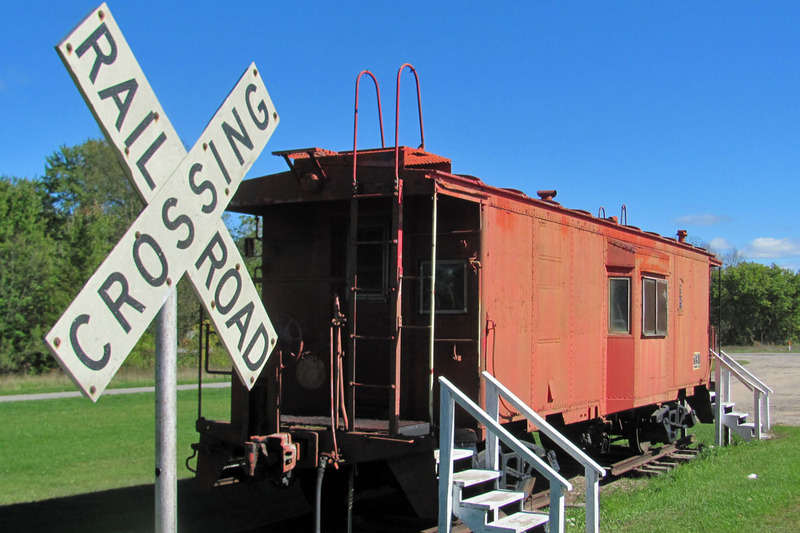 Along with the coal dock and lakes, the town is home to an old caboose and depot, both undergoing restoration. For food or liquid refreshment, there is the Lake General Store, The Lakeside Bar & Grill and a hardware store where among the many items it stocks are inner tubes pumps, chains, brake pads and other items often needed for bicycle repairs. Then when we are ready, turn your bike and ride back. Take it slow. Trains had a schedule to keep. On this trail, one shouldn’t. Stop means STOP! 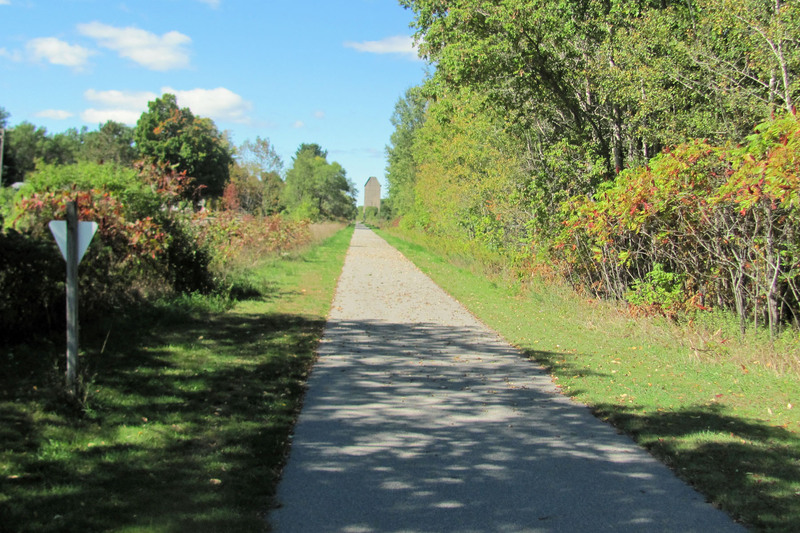 There are places where the rail trail crosses the road. 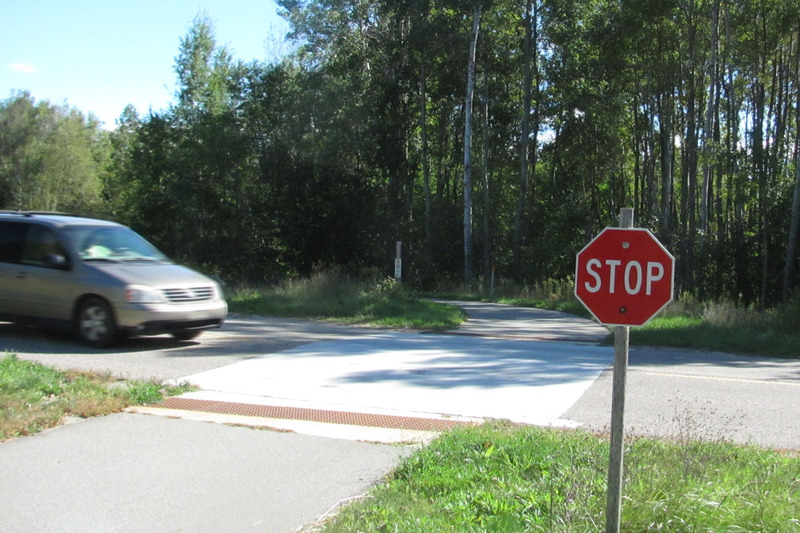 Cars and trucks have the right of way and they do NOT stop, so please be vigilant. 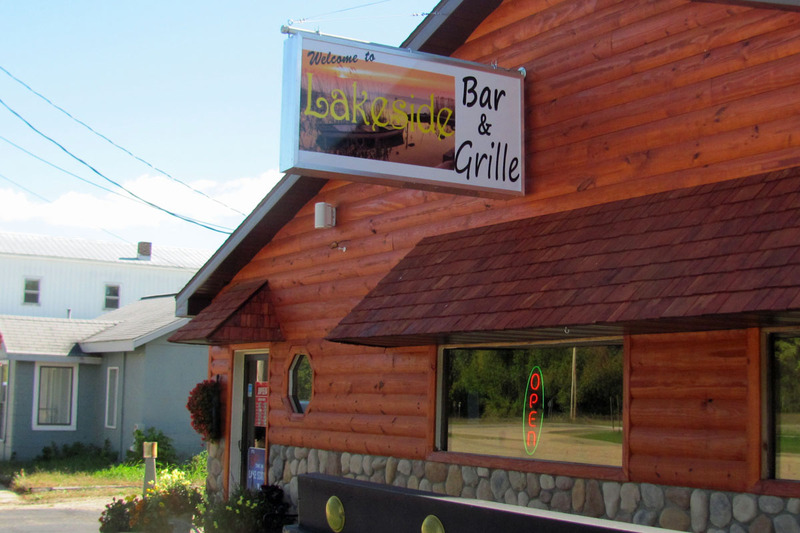 Lake General Store: Open Sunday – Thursday 9 a.m. to 9 p.m.; Friday and Saturday, open until 10 p.m.
Lakeside Bar & Grill: Open at 11 a.m. daily until at least 10:30 p.m.
Lake Hardware: Open daily but hours not recorded. The town offers a wide number of restaurants, bars, ice cream parlors and hardware stores. The Chamber of Commerce can help. There is even a walking or biking tour of town available at a nominal cost. Visitors may also want to visit the antique shop just east of town and adjacent to the rail trail. Ray’s Bike Shop in downtown Clare sells bikes, kayaks, outdoor clothing and more and also rents sports equipment such as bicycles both by the day and by the hour. I am a big fan of the shop and bought a bike from them this past summer. Although I started out looking for a Fat Bike I settled on one that is neither fat nor slim. Reasons were both economic (Fat tire bikes are REALLY expensive as are replacement tires) and practical. Although I was buying it to ride in sand, I figured I was not going to ride it in snow and mud, which is the main reason they are purchased.